I have a good friend who is an artist. It's not a dream. It's not a side hustle. It's what he does full time. He's not showing in any national galleries or touring around the country, but he does make a living doing something he is incredibly passionate about. A lot of people turn away from following their dreams because they view them as unrealistic. With enough work and persistence, you really can make those dreams come true. It may have to start as a side hustle until it morphs into something bigger. But there's nothing half bad about making a little extra money while doing something you love. 1. Online. There's no shortage of websites out there where you can sell your art via the web. Graphic artists can choose to sell pieces on larger websites that sell an array of items to print your design on, whether they be t-shirts or coffee mugs. These sites usually pay you a commission for each item you sell instead of the other way around. There are also opportunities to network and find businesses that need logos or other graphic art for their website or a larger picture deal. For fine art, there are also numerous online outlets. These websites tend to take a listing fee plus a pre-determined percentage commission when your item sells. Make sure you understand all those fees, along with any return policies, when making your decision where to sign up. 2. Murals. 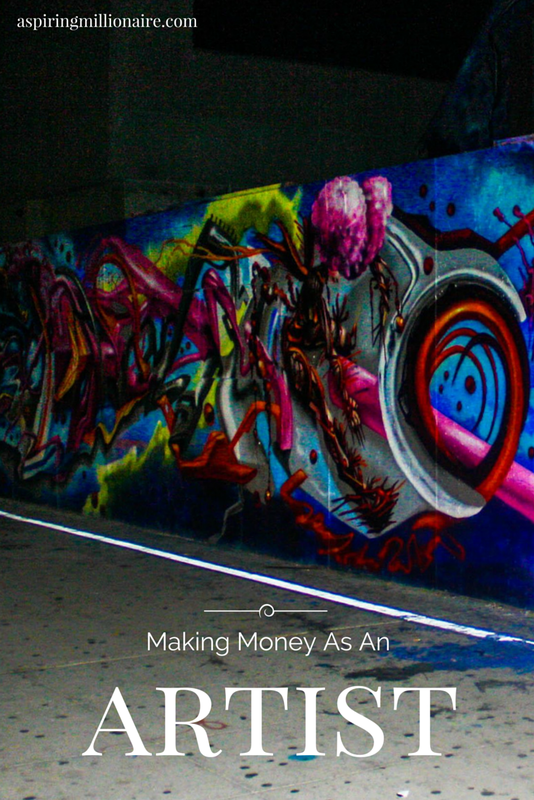 Indoor or outdoor, murals can be a great way to make money. Having a hard time getting into the market? Do one or two for free for people you know. When others see your work in their home, word of mouth can enter into the equation in a big way. As you gain popularity, you'll be able to increase your commission for each one you do. Mural walls in people's home could be anything from realistic scenery to something cute for the kids' rooms. Outdoor murals will most likely be a word of mouth, as well. That's how it has worked with my friend. But this word of mouth means getting into community centers, getting in touch with local government organizations, and letting businesses know you exist. Put your name and your art out there, and connect with people to let them know you're available and interested. 3. Commission Pieces. There's money to be made painting on a canvas, as well. A lot of people want fine art in their home, but most people don't place the value or significance on it to spend thousands of dollars. Be their budget artist. Once again, use your network to spread the word. Let your friends and family know you're looking for work, and show them your projects regularly. Don't be a pushy salesman, but hopefully they know somebody that knows somebody that's looking for something specific. You can also get started by submitting your work to smaller art shows. The piece may sell, but if it doesn't you've more than likely at least gotten your name out there. This is where the bulk of my friend's work comes from. As he is commissioned for more and more pieces, his work is seen in more and more homes. As his work is seen, others find they want to commission him, too. It's incredible how much his work has grown to this point because of it. If you're serious about wanting to be a career artist, there are two ways to plan for the future. The first is to make your artwork consistent and recognizable. This isn't to say every painting has to look the same, but your style should be the same throughout your work. When people are readily able to identify your work as your own, they'll be happier when you make those commission pieces for them, or more open with their pockets when your work appears in a gallery. The second thing to do is realize that you will probably need to diversify your streams of income. Your artwork itself may not be enough to sustain you, but when you add in speaking gigs or teaching jobs, balancing your checkbook starts to get a whole lot easier. Following your dreams isn't always easy. It may need to start as a side gig. You will have to heavily research whatever industry you're going into, even if you're going into it because you find it to be fun. But following your dreams is, indeed, possible. That's a super idea I've never encountered before!